♥ 200" MAX SCREEN, TWO SPEAKERS HIFI LEVEL STEREO AUDIO Dual big symmetrical speakers and 200" max screen-Our home theater video projector has two built-in speakers and it can output high, medium and low-frequency sound effect. With the screen size from 44" up to 200" max with distance 4.9-18 feet, enjoy the concerts and movies with your families at home. 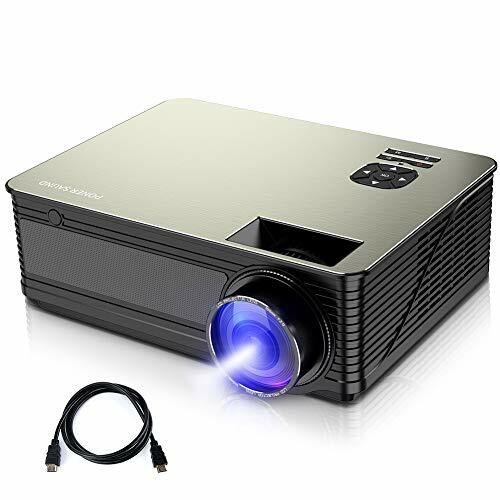 ♥ Native 720P projector, PONER SAUND new upgraded M5 projector 1280*768P, compare to normal 480p projector, it is better to support 1080P and HRD video. could offer a ultra accurate & vivid video quality. 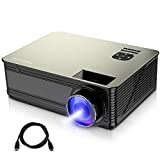 ♥ M5 projector support variety of multimedia formats that your source might is: HDMI, AV, VGA, SD Card, USB port, which allows you to use it to connect Laptop, Desktop, TV Box, Amazon Fire TV Stick, Chromecast, Tablets, Blue-ray DVD player, SD Card, USB Flash Drive, Ideal for projecting movie, games, presentations and graphics.